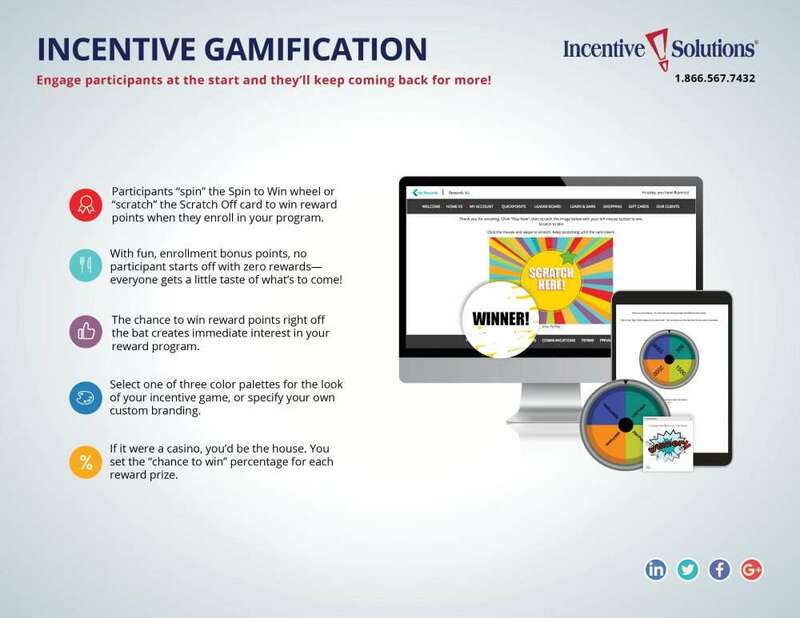 The Gamification Module adds fun, digital incentive games to your reward program. Engage employees, salespeople and customers with gamification to increase incentive program activity! Want to engage employees, customers or channel partners with incentive games? The Gamification Module gets your incentive program participants invested the moment they enroll! 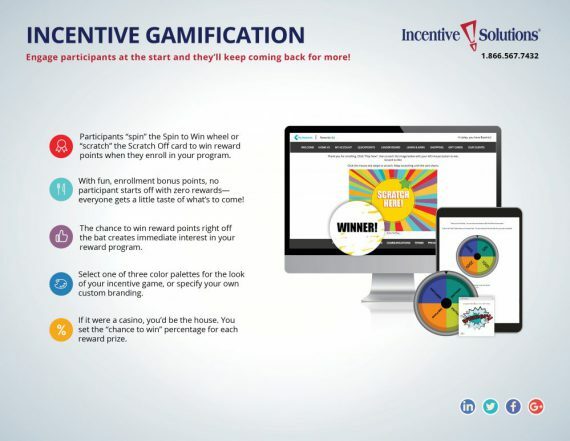 The Gamification Module is one of the many features we offer to engage employees, salespeople, channel partners and other incentive program participants. Your participants win reward points playing a fun, virtual incentive game when they enroll in your program, which locks in their interest. Winning that first batch of reward points lures your participants back for more, keeping the program active and racing toward your business goals! What are The Gamification Module’s features and benefits? Increase sales and grow profit share by improving sales performance among your middle majority of average salespeople. Schedule sales promotions targeting specific qualifying products or salespeople. Encourage greater product knowledge by offering incentive rewards for sales team members who participate in training. Offer sales incentives for submitting sales claims, invoices, warranty registrations and other purchase and customer data with online sales performance tracking software. Which pain points can The Gamification Module help you solve? Your program lacks the extra element of fun to motivate participants to register. Participants sign up for your incentive program and never come back. Reward program doesn’t engage employees, customers or channel partners, preventing the program from helping you reach business goals. Which types of incentive programs should use The Gamification Module? In a sales channel, your customers and sales reps operate in departments, organizations or regions separate from yours. A simple, easy-to-remember access point to your online rewards program helps you build mindshare so your channel partners are more likely to participate and helps you keep your reward points data in one place. As salespeople and employees, your sales team are more likely to be using multiple different online platforms. Integrating your incentive system with other online platforms increases salespeople’s activity in your program, while collecting their online point rewards in one place. If your employees frequently log in to your corporate website, intranet or LMS, The Integration Services Module helps keep your employee incentive program top of mind. Customer loyalty is essential to your brand’s survival, especially if you’re a B2B organization! Integrating your customer loyalty rewards program with your corporate website helps strengthen B2B customers’ positive associations with your brand and the loyalty rewards differentiator you offer. Which modules pair well with The Gamification Module? The Open Enrollment Module allows your unknown B2B customers to sign up to your program, without needing an invitation. Then they can immediately win points with The Gamification Module! Your incentive program’s value is apparent automatically! Learn more! Our rewards program through Incentive Solutions is designed to help entice some of our most important clients. Throughout our partnership, the folks at I.S.I. have been fantastic to work with – extremely responsive, very pleasant and always helpful. This experience was an ‘A+’ from the start. Incentive Solutions gets top marks all across the board. In today’s economy, we are always looking for new marketing strategies to further boost our business. Steve Damerow and his Staff have led us down a path of new and innovative ideas. From our Cybercash reward program, to our new Incentive Travel Program, we now have the tools that set us apart. Leggett is happy to have Incentive Solutions on our Team. We exceeded our sales target by over 127% in 2008 and developed, managed, and maintained relationships with the top 30 accounts on the East Coast. Our loyalty program drives over $10M in new business annually and helped us create $3.3M in incremental business over 18 Months. It also helped us negotiate and secure long-term agreements with 8 of the ENR Top 500 largest construction companies in the world.